Working on concrete requires the toughest work boots on the market, and that’s what we’re here to bring you! We’ve researched a plethora of different work boots in order to bring you the best options for concrete floors. We’ve provided some information so you know what to look for when you’re shopping, and afterward, check out our recommendations for the best work boots for concrete. You’ll find the perfect boots for you on our list. Material: This will tell you what the boot is made of. Some materials, like leather, are more durable and a little more flexible than others. You’ll have to choose the material that you prefer for your work boots. Gender: Is the boot for men, women, or both? Most boots can conceivably be used for both genders if you consider converting your size. Make sure you do this to get the right fit no matter who they’re meant for. 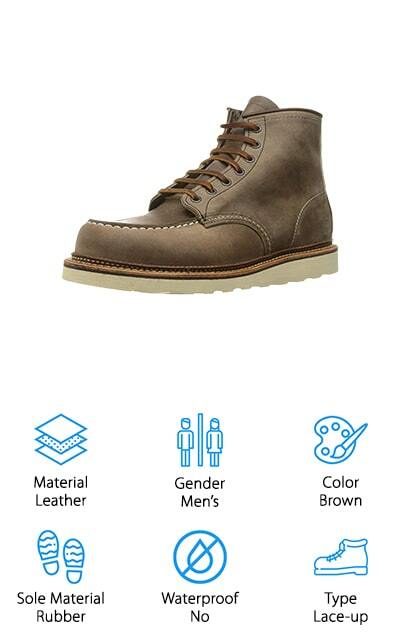 Color: This refers to what color the boot is, though there may be other color options available. Outside of uniform restrictions, you should choose the color that best appeals to you, and that you’ll be happy to wear. Sole Material: What is the sole made of? Most work boots that are made for concrete have rubber soles, but sometimes the soles are made of a synthetic material instead. Choose the sole material that you prefer in your boots. Waterproof: Waterproof boots completely stop the water from getting to your feet. Some of these boots are water resistant or partially waterproof, but we’ll let you know here if they keep your feet entirely dry in wet conditions. Type: There are multiple types of boots, but the ones are this list is, for the most part, either lace-up boots or pull-on boots. Lace-up boots will, of course, need to be tied onto your feet. Pull-on boots have no laces. With that information tucked away, we can start showing you the best rated work boots for concrete floors. 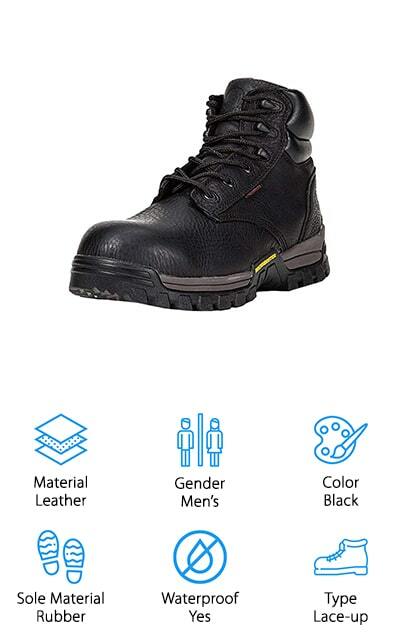 We’ve hand-picked these boots for their ability to cushion your feet on concrete floors and make sure that you’re comfortable all the way through your shift. Our top pick and budget pick are our personal favorites, so check out these highlights first before continuing through the rest of the list. Your new comfortable work boots await! Red Wing makes the best work boots for concrete floors that we found during our research. These shoes are made of oil-tanned leather, which means that they look naturally distressed and comfortable. The soles are rubber, great for absorbing shock on concrete floors. These boots go up to your ankle, giving you excellent support there. The lace itself is even made of leather! It’s a nicely-cushioned boot that will keep your feet from being fatigued during your long work days on concrete floors. They tend to run large, so they recommend buying a half-size smaller than your regular shoe size to get the perfect fit the first time! These are comfortable shoes that look great as well with jeans or whatever uniform you have to wear. Red Wing is the top of the line when it comes to work boots, and these definitely belong at the front of the line. The outsole is even made of tractor-tread! Stanley Dropper makes these leather work boots. They’re durable and great for those long days on concrete floors. They are extremely lightweight, so you won’t be slogging around with heavy shoes all day. They have a removable polyurethane footbed to keep your feet comfortable, and if you want to add your own insole you can take them out and put your preferred ones in. They have flexible rubber soles. All of these features make these shoes extremely comfortable, but by far the more comfortable feature of these shoes is that they don’t have a break-in period. When you put these shoes on the first time, they feel like you’ve been wearing them for years. That’s what makes them some of the best work boots for concrete floor work. The upper part of the boot is resistant to acids and oils, while the sole is slip-resistant for work in wet or slippery environments. We love these affordable boots! Doc Martens are some of the most popular shoes, and these boots are no different. These are the best steel toe work boots for concrete that we could find because the Dr. Marten name means quality. 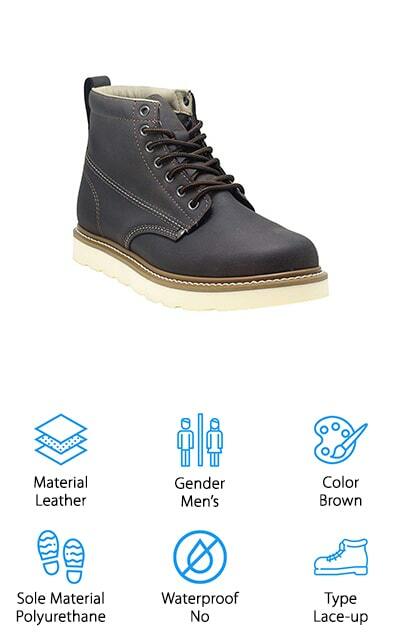 These are genuine leather boots with a synthetic sole. The upper parts of the shoe are water resistant but not entirely waterproof, and that allows them to be breathable and reduce discomfort associated with sweating. The footbed is entirely made of EVA foam covered with a nylon mesh that you can remove in order to use an insole or another comfort. The soles are non-slip, so you can move all over your worksite without slipping and sliding. The leather that they are made of is top-quality leather, supple and durable. The toe cap is made of safety steel so you can do all of your hard work without hurting your toes. And they won’t rub on the leather, either! Golden Fox makes these amazing leather work boots. They are made of full-grain leather that’s made to repel water, on the job and off of it. The insole is a dual-density material that contributes to less fatigue overall on your feet during long work days on your feet. The heel cushion helps support your lower back and legs so that you feel less worn down after a long day of work. This is especially important when working on concrete floors – anything that can keep your feet comfortable is definitely a good idea! The lining on the inside of the shoe helps wick away moisture and sweat so that your feet don’t smell or feel uncomfortable. Plus, that lining gives you an additional layer of warmth on days when it’s especially cold. 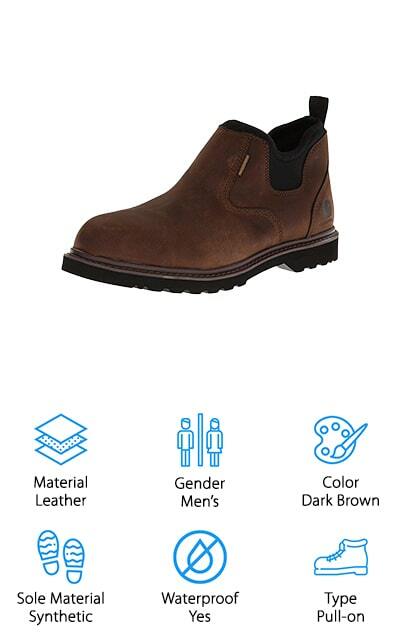 Everything about this shoe by Golden Fox is tailored to your comfort, and along with the overall quality, that makes them really good work boots for concrete floors. 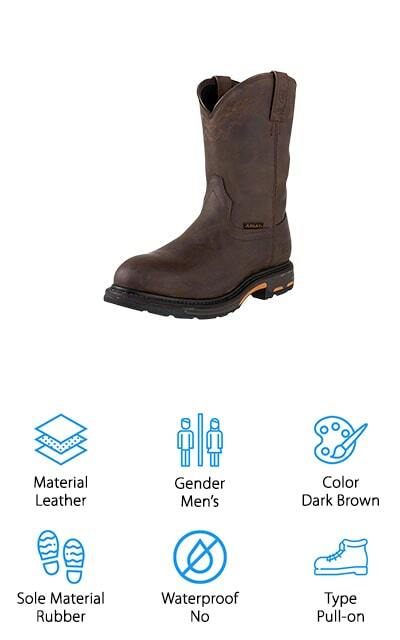 Ariat’s work boots are made entirely of a beautiful and masculine dark brown leather. The sole is rubber and made to help keep your on your feet even in slippery conditions. The outsole is made of the powerful Duratread blend, which won’t fail you when things get slick. There are quite a few benefits to the layering system of these boots, including a moisture-wicking footbed on top of a gel footbed, to help increase shock absorption. This will help to keep your feet comfortable no matter how long you have to be on them. The outsole is oil- and slip-resistant in nearly all conditions, and it’s flexible on top of that. These are some amazing work boots that can help you stay on top of all of your tasks even when you’re working on concrete floors. The genuine leather is beautiful, and it comes in lighter colors as well if you prefer them. These work boots by ROCKROOSTER are the best composite toe work boots for concrete. The toe cap is made of durable composite materials, including carbon fiber. It’s a non-metallic and non-conductive, so you don’t have to worry about the material contributing to any harm that might depend on the work environment. They don’t get hot or cold and won’t corrode either, which in certain conditions, makes them more favorable than steel toe boots. They have a great temperature control system, where your feet stay warm in the cold months and cool in the warm months. This is in part due to the interior moisture wicking and quick drying features that allow all of your sweat to be wicked away. The leather upper has a waterproof membrane system that will keep your feet dry from outside sources. These shoes are both durable and comfortable. When you’re on the job for the long haul, these are the shoes you’re going to want. EVER BOOTS make these work boots for concrete floors. 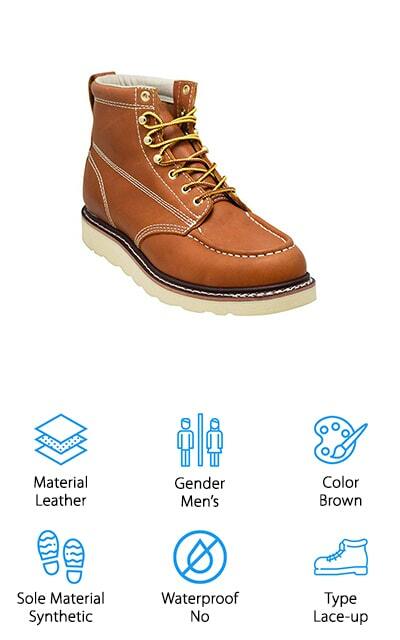 These construction boots are made of premium oil full-grain leather that is soft and pliable. After the short break-in period, you’ll have a pair of perfectly comfortable brown leather construction boots that will keep your feet from aching after long days on the job. There’s a removable insole that you can use as-is, or take out and use your own preferred insoles. The toe is reinforced with extra stitching to make sure that these shoes are going to last forever. The soles are synthetic and won’t slip all over the place when the job gets slick. The wedge sole makes the shoe extra comfortable, and the sole is completely resistant to oil. These shoes by EVER BOOTS aren’t just good for construction – they’re great for all types of work where you’re walking on hard, unyielding floors, specifically concrete. We love these shoes, and we know you will too! KEEN makes some of the best pull-on work boots for concrete that we found on our list. The uppers are made of 100% genuine Nubuck leather, which is completely waterproof to keep your feet dry and warm even when it’s cold and wet at work. The outsole is rubber, and it’s non-marking as well as oil resistant and slip resistant. With these shoes, you know you’re staying on your feet. The footbed is made of dual-density EVA foam that will support your foot and help combat fatigue that comes with being on your feet all day. There’s an elastic panel on the side of the shoe to help create a breathable environment within it. We love that the steel toe portion of the boots are asymmetrical, so you get a comfortable fit and your toes won’t rub against the material. This reduces the occurrence of blisters and keeps your feet as comfortable and dry as possible. When you think of work boots, what’s the first brand that you think of? Carhartt should definitely be at the top of that list. 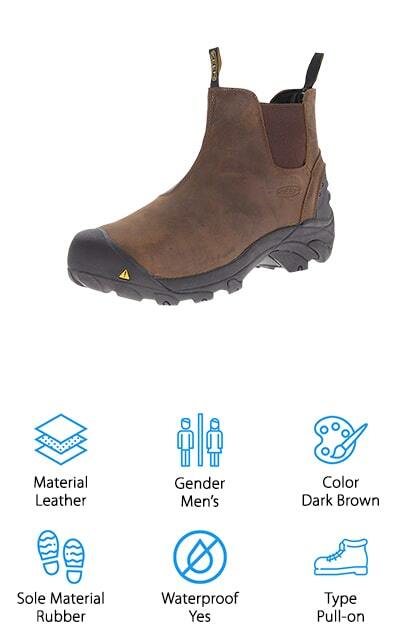 Their gear is synonymous with quality, and that includes these amazing pull-on Romeo work boots. They are made entirely with 100% imported leather. It’s oil-tanned, so it’s extra durable and looks amazing with your jeans or work clothes. The upper is also neoprene, so you get a great fit that feels wonderful on your feet. These boots are completely waterproof, as you put your foot into a waterproof lining when you put them on. Nothing is going to get through that boot to get to your foot. It has about a 1-inch heel so you get that perfect platform that’s comfortable and will absorb the shock from your steps. If you work hard, invest in some quality, comfortable shoes to keep your feet happy! They are light and great for on-the-job and off-the-job as well. 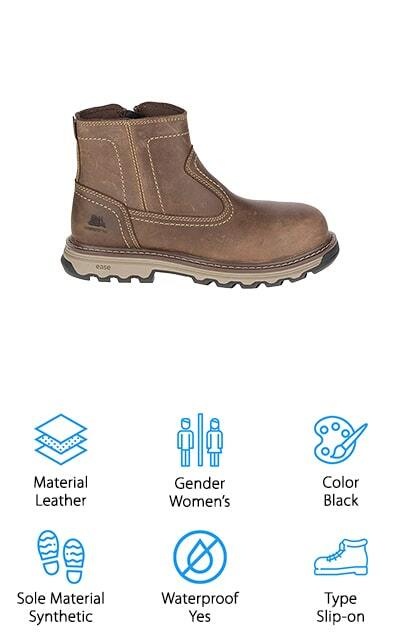 Caterpillar, the renowned manufacturer of construction equipment, makes these amazing Nano boots for women. The upper is made entirely of leather that will keep your foot comfortable and secure while you go about your workday. The sole is synthetic, but it will help to absorb the shock of your steps. 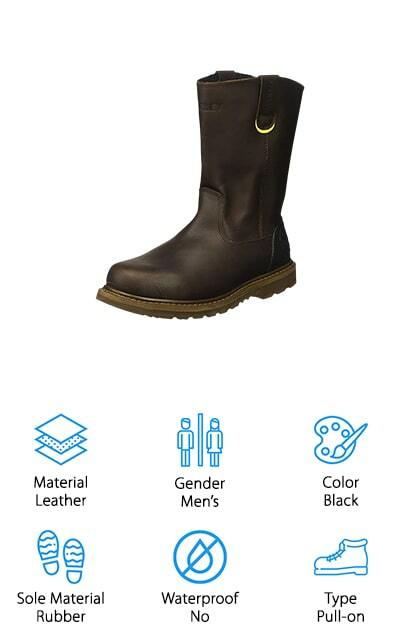 The outsole is also slip-resistant, and these boots are rated to be great for electrical work. It’s a slip-on boot that you can zip up to keep it on your foot. We love that it doesn’t tie on! In addition, the footbed has advanced cushioning and additional padding to help keep your feet feeling great after being on them all day, especially on concrete floors. It has a composite safety toe that is made with durable carbon fiber. These boots are made for women, so make sure you’re ordering your correct women’s size for the perfect fit. You’re going to love these heavy-duty boots!